Just about every travel-loving person I’ve met has one thing in common on their bucket list: to see the elusive yet spectacular northern lights. Nothing amazing in life comes easy, though, and the northern lights are no exception. After 3 failed attempts to see the northern lights in the past, I decided to roll the dice on them yet again over a week-long Thanksgiving trip. The latest adventure? I’d chase the northern lights in Tromso, Norway. I was pretty apprehensive about flying all the way to Tromso to try and chase the lights yet again, as it is in the Arctic Circle and isn’t very easy to reach. However, I got really lucky and got to see the Northern Lights four days in a row while I was traveling in Tromso. Yeah, that’s pretty rare unless you live in the Arctic Circle or work as a northern lights tour guide. Those nights, despite the bitter cold, were some of the most spectacular and awe-inspiring nights of my life. All in all, I’d highly recommend visiting Tromso for the northern lights. The northern lights aren’t a sure bet anywhere in the world, but Tromso is a fantastic destination to attempt to see them. Besides chasing the auroras at night, there are so many things to do in Tromso, like reindeer herding and dog sledding, that can keep you entertained for days. When and where can you see the northern lights? 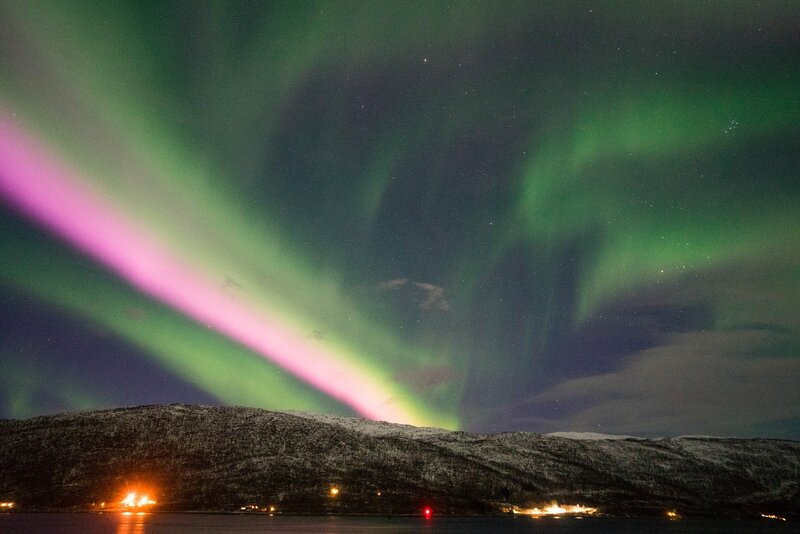 Why visit Tromso, Norway to view the northern lights? You might be curious about what the northern lights actually are, and why they only occur in certain areas of the world. In short, the lights are caused by collisions of charged particles from the sun with atmospheric gases. When the solar wind occurs, particles shoot towards the Earth at high speeds. The lights can be different colors, depending of the types of gases that these charged particles collide with. Oxygen creates the most common green auroras, while nitrogen auroras produce red and purple light. If you’re curious to learn more, this post explains the aurora borealis phenomenon better than I ever could, including the relationship of solar activity and why certain auroras are different colors. There’s a reason the aurora borealis has been nicknamed the “northern lights;” because they’re most easily seen from the northernmost parts of the world. This is because the northernmost and southernmost parts of the world are closest to the magnetic poles of the Earth, and this is where the collisions are most likely to happen. Some common countries for seeing the northern lights include Canada, Alaska, Iceland, Greenland, Norway, and Finland. You must plan your trip in the winter – the northern lights are not visible in the summer because the sun doesn’t set in this area of the world. Typically, you have the opportunity to see the lights from September to April. Unlike many places in the world where the northern lights are visible, Tromso is perfectly situated for viewing the northern lights, as it is located in the Arctic Circle and sees generally mild weather conditions during the winter. There’s a sizeable airport in Tromso that has several flights each day from Oslo and other nearby cities, making it easily accessible if you’re short on time. The most popular time to see the northern lights in Tromso is October through February, but they are visible from as early as September until as late as March or April. I went in November and saw them every day. Knowing this, be sure to keep in mind that there’s a decent chance you may not see the lights. Even if you cross your fingers really hard. Even if you bribe the northern lights fairies. And yes, even if you’re on a northern lights tour. Your chances of seeing the northern lights in Tromso increase the more nights you have in town. If you’re only there for 2 days and it storms both nights, then you’re pretty much out of luck for seeing the auroras. However, if you spend 4-7 nights in the city, your chances of seeing the lights will be higher because you have more chances to try again. If your top priority is to see the lights, I recommend spending your entire trip in the Arctic Circle, where your chances of seeing them will be much higher. However, you can move around a bit between Tromso and nearby towns and viewing areas, like Alta and Senja, or to more southern areas, like Tröndheim and Lofoten. Here’s an epic itinerary for two weeks in Norway in winter – you can see the northern lights from almost all of the places on this list! Driving in the Arctic Circle can be extremely challenging, with dark, icy roads and high winds being very common. In my opinion, it’s best not to leave it to chance if you are not an experienced arctic driver. Instead, sit back, relax, and let the experts do the work. Especially if you’re visiting the arctic circle or viewing the northern lights for the first time, I can’t stress this enough. Join. A. Tour. I know, I know, you might not be a “tour person” or perhaps you don’t want to shell out the money, but I guarantee that if you really want to maximize your chances of seeing the northern lights, a tour is the best way to go. In addition to being experienced northern lights chasers and experts on the region, many guides can also help take photos of you with the lights (a difficult feat, indeed), or provide photography tips so you can learn how to photograph them yourself. So, while the price of northern lights tours may seem high, you’ll be getting a lot of value and a once-in-a-lifetime chance to see the auroras. Viewing the northern lights isn’t usually a hit and run kind of deal. You have to be ready to travel long distances and stop at a moment’s notice to see them. Often, the lights get brighter and more colorful as the night progresses, so you’d really be missing out by only spending a few minutes trying to chase the lights. Because it’s a very time- and distance-intensive process, be ready to spend the whole night (sometimes until nearly dawn) chasing down these elusive natural spectacles. Light pollution can really inhibit you from seeing the northern lights, even if they are there and the skies are clear. You’ll be able to see the lights much better if you get outside of the city and go somewhere with clear, dark skies. Plus, it’s much more beautiful to see them amidst beautiful mountains or reflecting off the water. To do this, you’ll either need to rent a car (not recommended unless you are experienced with driving in the Arctic) or hop on a tour (see below). I’m not going to sugar coat this one: you’re going to be cold AF. Not only will you be in the Arctic Circle, but you’ll be in the Arctic Circle at night in some pretty rural places. This means there will be wind, ice, and potentially snow. Knowing this, wear LOTS of layers and don’t forget a hat. Yes, I’m talking all of your best layers, from your merino wool baselayers all the way to your puffy overcoat. Sweat wicking tank top/t-shirt – I adore my Prana sweat wicking tank tops and literally bring them on every trip I go on. They also have great t-shirts for women and men. Quarter zip thermal layer – A standard running thermal layer works really nicely for layering. Puffy down sweater – My go-to is my compressible down sweater. I take it literally everywhere with me. Icelandic wool sweater – I bought my lopapeysa (traditional wool sweater) in Iceland, but you can find similar ones here. Parka – You’ll need a parka to seal the deal. The one I have is really similar to this one and it did the trick nicely. Your feet and hands are going to be cold no matter how many layers you have on. So, if I could do my trip over again, I would have told myself to bring some self-heating hand warmers so that I didn’t feel like my fingers and toes were bleeding/falling off every time I spent more than a few minutes outdoors. While many tours will take photos and share them for your own personal use, you’ll probably want your own photos to cherish this amazing spectacle. Your iPhone, sadly, isn’t going to be able to capture the lights at all. So, if you’re interested in taking your own photos, don’t forget your camera and tripod. One of the most soothing things provided during my aurora borealis tour the first night was some warm hot chocolate and a bonfire. If you go on a tour, many providers will offer hot drinks included in the price. After being out in the cold photographing and marveling at the lights, a warm drink literally feels like heaven. However, I still recommend bringing some hot tea or hot chocolate in a thermal mug (I love my Hydro Flask for this exact reason) so it will stay warm all night and you’ll have access to a burst of warmth whenever you need it. Trust me, you’ll thank me later for this one. Like I mentioned above, there’s a chance you won’t see the northern lights at all during your trip. I know this isn’t what you want to hear – it’s not what anyone wants to hear when they’re planning a trip. However, it doesn’t have to be the end of the world for you. You might have to try 3 times (or more) before you actually get to see them. I attempted to see the lights in Canada, Michigan, and Iceland before I finally got lucky and experienced them in Tromso. To help ease your worries, be sure to plan other excursions during the day (some suggestions below) and enjoy the scenery and winter activities around Tromso too. This way, whether you see the lights or not, you’ll be sure to have a lovely trip if you diversify your activities and enjoy many of the non-lights things that Tromso has to offer. I only went with one tour operator – Chasing Lights – during my time in Tromso, Norway, and I’d recommend them completely to anyone looking for a qualified guide and driver to see the Northern Lights in Tromso. Chasing Lights offers tours for any kind of traveler, from big bus chases (which is the cheapest option, and is what I did) to private guides and tours. They cannot guarantee that you’ll see the lights on your tour, but they work extra hard to find the right light and weather conditions to see the auroras, sometimes driving all the way out to Finland to find them! During the course of the evening, your Chasing Lights guide is there to take photos of you with professional camera equipment and offer tips on how to photograph the lights yourself. If you’re an amateur photographer or simply want to understand how to use your camera to capture images, this is a great resource for you. Later in the night, the guide also builds a bonfire and supply hot chocolate and cookies to help warm you up under the lights and the stars. I loved my Chasing Lights tour so much that – despite the Norwegian price tag – I booked another tour for the next night. If you’re headed to Norway and want to find the best northern lights tours in Tromso, look no further than Chasing Lights. One con of visiting Tromso (or Norway in general) is the cost. It’s EXPENSIVE. In order to not burn a hole in your bank account, consider staying in a budget hotel, a hostel, a campsite or an Airbnb in Tromso. The cabins at Tromso Camping – This summer campsite offers heated rental cabins during the winter, including an economy option. Tromso Activities Hostel – I would have stayed here if I were traveling solo during this trip! There are also plenty of full-service hotels in town, but don’t be alarmed when you see the prices, which are much higher than you’d find in most other places. 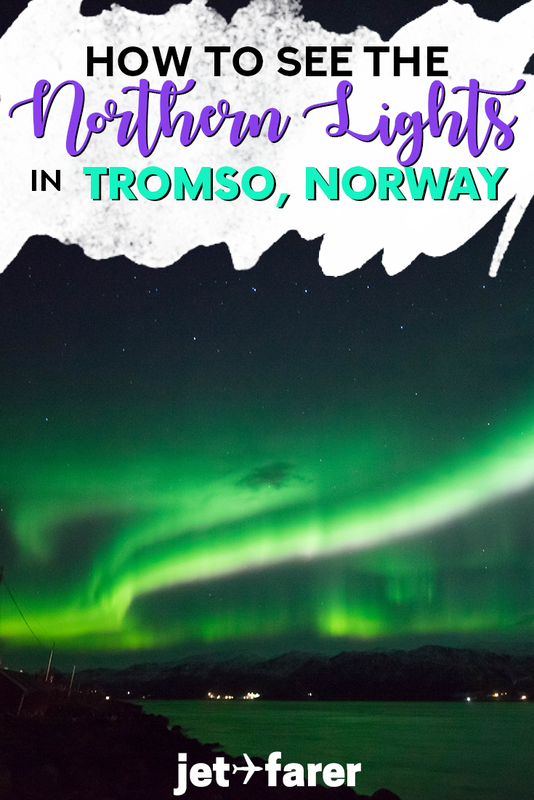 Traveling to see the northern lights in Tromso, Norway is a once-in-a-lifetime experience, and I couldn’t recommend it more. Tromso itself is beautiful and fun to explore, and the northern lights are truly a spectacular sight. With the right planning and expectations, you’ll be sure to have a fantastic trip no matter what.